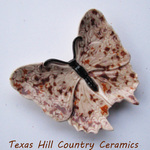 This ceramic Butterfly can be used as a Tea Bag Holder, small Spoon Rest or Universal Catch All. The butterfly has open wings and looks as if it is resting on a flower in a meadow. The wings of the butterfly highly detailed, the butterfly body is all black with the exception of the one finished in solid white. Dishwasher safe however hand washing is recommended. Please keep in mind each butterfly has its own individual characteristics and the butterflies with color spots on the wings will vary from the one in the photo. Butterfly tea rests are available in a variety of colors including kaleidoscope, white, purple, stained glass, black with gold and warm earthtones. This piece has many uses. It can be used as a personal tea bag holder or caddy to hold used tea bags or as a small spoon rest or as a desk accessory to contain paperclips or staples. It can also be used to hold rings or jewelry next to a sink or night stand or to keep earrings safe. This piece is ideal as a decorative accent too. They also add to a tableware place setting theme, use them to serve condiments or small portions of anything you can imagine. And if you are tired of drippy spoons or sticky messes next to the coffee or teapot this piece will help keep those areas neat and clean. This piece is great for those with limited space, some styles can be stacked too. Orders ship in approximately 7 - 10 business days.